The Hard Data and Musicoin Content ProgramsteemCreated with Sketch. Following the success of The Hard Data & Musicoin Pilot Program, both entities have decided to extend the content creation aspect of the Pilot Program until at least January 31, 2018. What that means is, between now and January 31st 2018, writers, editors, photographers, artists, proofreaders and other content related jobs will be receiving Musicoin for their contributions to The Hard Data website and magazine. In August of 2017, the Pilot Program of which this initiative is based on doubled the readership of The Hard Data, and Musicoin tripled its value in US dollars. 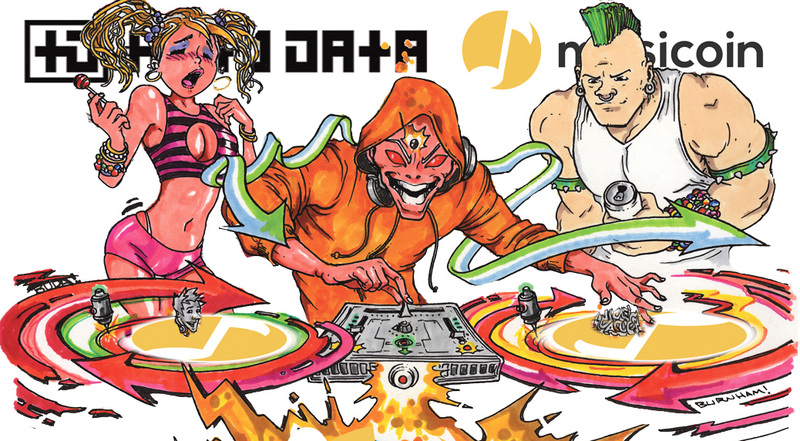 Creative types unfamiliar with cryptocurrency were introduced to the ecosystem, and readers of The Hard Data were treated to an expanded palette of content related to their favorite music genre: hard electronic dance music. Because the price of Musicoin tripled (though now the value has pulled back a bit) over the course of the pilot program, content rewards will be half the amount of Musicoin received previously. We hope that by the end of January 2018 Musicoins will rise again in value, and contributors can see their efforts rewarded even more so should the price jump be significant. The Hard Data will be paying the following rates for content produced on a work-for-hire basis until January 31, 2018, no matter how high or low the price of Musicoin is compared to the US Dollar. A 500 word (or more) article about some subject pertinent to hard electronic dance music, such as interviews, party reviews or previews, editorials, music reviews. A list of your 10 favorite tracks of the month, starting with #10 going down to #1. Each track must have a link to its purchase link on either musicoin.org, hardtunes.com, iTunes, Amazon (in that order of preference). If no purchase link is available, insert the download, Youtube, or streaming link. If a track has a good video, it would be good to insert that as well. Photography, artwork, images = 5 MC per image. In the case of photographers, it is expected that they will be uploading multiple images to The Hard Data’s Facebook photo page. So, if 10 photos are uploaded, that would equal 50 MC. However, we expect about 50 images per event. For 50 images (or more) they would receive 250 MC (please note we are capping the payment for albums at 250 MC to prevent people from uploading mass irrelevant photos). Each time a writer or editor uses one of their photos in an article, however, the photographer or artist would receive an additional 5 MC (only until January 31, 2018, though). Writers or content creators that insert their own, legally compliant fair-use or copyright cleared photos will also receive 5 MC per photo. Please note, never use a photo on http://theharddata.com unless it is one of our photographers, or is copyright cleared. The editor confirms that the article is formatted correctly, hyperlinks work, and spelling and grammar errors are non-existent. For a 500 word or more article, or Top 10, the reward is 50 MC. d. 10 Forum posts with a link to the article. You should be an active member of the forums you post to. e. 30 relevant Steemit.com comments with links to the article. f. 30 links in Reddit Subgroups. g. If there are other venues you would like to promote on, please tell us about it and we will try to accommodate and come to an agreement with you on proper compensation. For example, we don’t have much penetration on Pinterest or Snapchat right now, so we are open to proposals in those and other social media venues. So, an example of a “combination share” would be: a person shared an article to 15 different Facebook groups, made an Instagram post with 10 hashtags, and made 10 Twitter tweets each with 2 hashtags. This would qualify for 250 MC, just as a straight 30 Facebook shares would. The share checker makes sure that the person about to receive a sharing reward made good links and wasn’t spammy. For the months of September 2017-January 2018, The Hard Data aims to publish and share an average of 20 different content items (articles, top 10s, photo albums) per month. If you would like to be a contributor for The Hard Data, please get in touch with us and tell us what you want to contribute, and when you plan to do it. Though we have a solid stable of writers and photographers, the increased content schedule is opening more content slots that will need filled. You must post the article or photo album yourself, after your register for an account on http://theharddata.com or we give you access to one of our social media pages. We use Wordpress as a platform, if you are unfamiliar with it, we will teach you how to use it.